Now here’s a testament to build quality. If you’ve ever lamented about your electronics dying after just a few years, you’ll be impressed with Colin Pullinger & Sons’ Perpetual Mouse Trap which, 155 years after its design was originally patented, is still successfully catching mice. They say if you build a better mouse trap the world will beat a path to your door, but apparently mankind’s mouse trapping ingenuity peaked back in the late 1800s. Yesterday, the Assistant Curator of the Museum of English Rural Life (MERL), at the University of Reading, in the UK, discovered that the antique trap had worked once again, trapping and killing a mouse that had somehow snuck into the museum. The terrible irony of the mouse’s demise was that having successfully snuck into the museum, it had access to a lifetime’s supply of wood and paper products for it to survive on—and possibly even build a cozy little mouse cabin with. 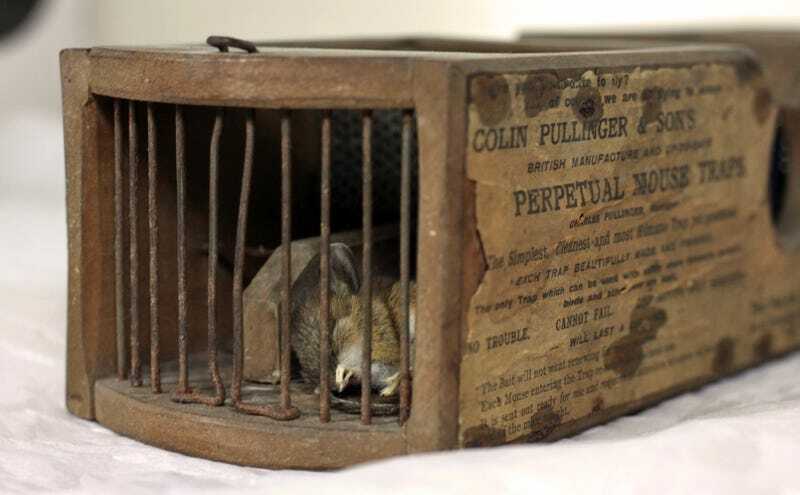 But, even though the Colin Pullinger & Sons trap hadn’t been baited for decades, the mouse still decided that climbing inside was a great place to start its explorations of the museum. And devoid of batteries, electronics, or other components that would have degraded and stopped working after 155 years, the trap still performed as admirably as it would have the day it was first assembled. As for what’s left of the mouse, the museum and university are debating having it taxidermied and put on display alongside the trap, as a testament to its ‘Will Last a Lifetime’ claims.